#030.532.0100 is Lloyd in a Black Kimono with Black Ninja Wrap and Green Bandanna, and, Black Tube Scarf . It is a simple minifig minibuild comprising of 5 parts. 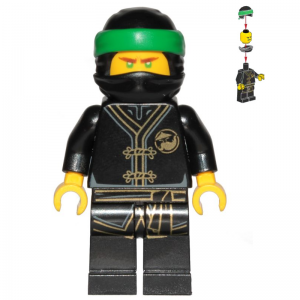 This minibuild (minifig) is themed as ‘Minifig > Ninja’. It’s universe is ‘Ninjago > Sons of Garmadon’. 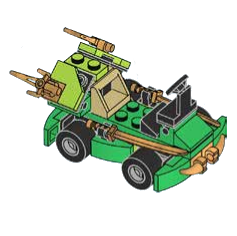 Since the instructions do not wield Lloyd with any weapons, rather the Lloyd’s weapons are at hand from his go-kart, a minibuild minifig weapon combination is not cataloged here. Bricklink has this minibuild available as minifig #njo425. The other minibuild is Lloyd’s Turbo Go-Kart, a 4-stud wide and 4-stud wheelbase go-kart form vehicle. It comes in green with pearl gold bull-horns and lime tail wings and spoiler. There are four weapons (two sai, and two shamshirs/katana) on attachment on both sides of the go-kart. This minibuild is made of 61 parts. 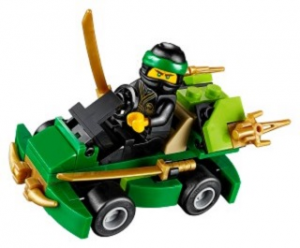 Themed in the catalog as ‘Vehicle > Go-Kart’, and universed as ‘Ninjago > Sons of Garmadon’. As always, if you see another minibuild opportunity in this set or you agree/disagree with the decisions made please comment below for a healthy discussion.